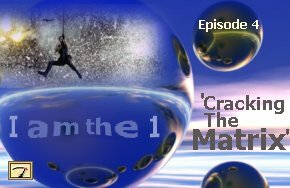 The Next Level :: View topic - Episode 4: Cracking the Matrix- "I am the One"
Posted: Thu Feb 02, 2006 12:19 pm Post subject: Episode 4: Cracking the Matrix- "I am the One"
Just finished it. I like how you make the comparison with the "agents" after cracking the matrix. I can relate, except the "agents" are a of a different nature. So what ends up occurring is that instead of being the living soul who sits on top of the list and who only answers to his creator (god, YHVH, Allah, mother nature, All-that-is, the infinite, whatever you wish to call it) and the natural laws; we take on the persona of the strawman who sits on the bottom of the list and who answers to his creator (the government) and it’s statues, acts, regulations, rules and bylaws. Worlds and men were in turn formed and destroyed, under the law of evolution and from pre-existing material, until both the planets and their men, in our case our Earth and its animal and human races, became what they are now in the present cycle: opposite polar forces, an equilibrized compound of Spirit and Matter, of the positive and the negative, of the male and the female.... There was a spiritual, a psychic, an intellectual, and an animal evolution, from the highest to the lowest, as well as a physical development – from the simple and homogeneous, up to the more complex and heterogeneous; though not quite on the lines traced for us by the modern evolutionists. This double evolution in two contrary directions, required various ages, of divers natures and degrees of spirituality and intellectuality, to fabricate the being now known as man. fintan your TreeIncarnation Rocks! I am curious, what are your feelings on the movie "What the BLEEP do we Know?!" ?? I feel like a lot of what you say parallels what the movie is about, yet you still go deeper than anyone i've ever heard. Cant wait for the tree of life!! Your political analysis is spot on Fintan and I back you up all the way on it. Its daring, independent, and has tremndous forsight. When it comes to the nature of reality however, your analysis stikes many chords with ancient Vedic phiolosophy. However unlike Vedic knowledge, you rely on your own senses to work out what is going on. This is simply false ego at work. According to the Vedas, this universe, the smallest of trillions of universes, is made of material energy or matter and is controlled by the laws nature. The mirror plane, or yin and yang, or duality and the mind is not the be all and end of it. Vedic wisdom teaches us that the universe is multi dimensional (64 main dimensions, unlimited inter dimensions) In terms of human existance, conciousness is not the body or indeed the mind. In terms of energy there is the body, then the mind, then intelligence, then the false ego. Each aspect is a form of matter more subtle than the next. The false ego is there to tell you "I am Fintan! I am this body, I was born a physical body and my physical body will die! There is nothing more to me than me. I am the centre of the universe, material things are the source of happiness and I will be happy if I exploit material nature or matter..."
Then there is intelligence a more subtle aspect of the mind, it has direct communication with the soul but is generally influenced by the mighty false ego. The mind is the subtle aspect of the body. It is there to direct every function of the body and then of course there is the body the tangable form of matter that we can perceive with our senses. At the top of the tree of course is the soul or the real you, it is the one form of energy that is at odds with the rest of the universe, for every thing that exists in the universe including the universe adheres to the laws of nature or matter. One of the laws being that all matter has a beginning, is sustained for a period of time, and finally breaks down and disappears. Applied to living beings this means we are born, we live for a while then we die. Vedic science is very much in unison with Western science when it comes to analysing matter, the fundamental difference however is that life does not come from matter. The Vedas tell us that matter come from life. This simple statement undermines every fundamental notion of Western thinking. It is the complete dichotomy theories and I emphasise theories of the big bang, life evoving from matter, evolution its self, life being nothing but an exchange of chemical reactions, reality being limited to three dimensions, and most sinister of all you only live this life and that's it folks. Western science is an elaborate system of cultural brain washing that is designed to deny you of the opportunity to discover you divine nature. Vedic knowledge teaches us that at the heart of our concious being is the soul. The eternal atomic form of energy that actiates matter into puposeful actions. Example 1. A stone cannot move independently or reproduce or exhibit any of the symptoms of a living being because it does not have a soul. Example 2. What is the differnce between a body that has just died and one that is still alive?. Chemically the are the same. The difference is that the soul has left the body leaving the body as matter without life. Example 3. Look in the mirror, what do you see? You see your body and you see it with your eyes. But are you your eyes? are you your brain? Are you your body? What is that subtle aspect of you that is called conciousness. Ask any expert in Western science if he can expain consciousness, the answer will be no! A car will not work without a driver just as the body will not function with out the soul. Just as the body and the senses are the physical interface or machine that allow the soul to navigate the material energy. We are taught from the moment we are born that we evolved from nothing, that we are nothing more than a series of chemical reactions and that nothing exists beyond matter and that matter is the ony thing that will make us happy. What if revealed knowledge told us that our true nature is eternal, blissful all knowing. That we come from a dimension beyond the limitations of time space and matter. That our free will allowed us allowed the universe to be created so that we could come here to experience existence the material energy, the matrix. To try and lord it over nature. To experience the consiquences of tampering with the material nature. In short to see what it is like to play God in a universe designed to frustrate the living entity into the realisation that ultimately, "I am not the body." First time poster, listener of all 4 episodes so far. Great new theme-tune before i forget. That I/we are standing on one side of a hypersphere (earth) and that the surface of the planet is a holographic projection of the inside, which is actually nothing, or to be more exact - 0. This universe was created, taking the big bang analogy, by the relationship between 0, 1 & 2. 0 effectively acts as our hands meshed together (in the mirror plane analogy) encompassing everything and nothing, moving at C2. I am quite content understanding the concept of 'void' before the existance of the universe, and that void is actually everything/nothing (as it was 15billion years ago, as it was 1 second ago). So it could also be argued that the the known universe (to us) is a hypersphere where we are nothing (0) and that our holographic representations are on the outerskin of the universal hypersphere (I'm taller/better looking:). You could even go further to say that the relationship between the human brain at the quantum level and the universe is complimentary. The graphics of electric sparks as well as those images of the human brain could be argued to reflect the same thought = that is the infinite amount of signals processed in my neural network is the behaviour and personality of the universe (exploding stars, comets). The relationship between me/us and the universe can be demonstrated at both a quantum (micro) and meteorological (macro) level. Taking the Dirac dance as an example, the relationship (perhaps better to say bond) between an electron and its observer is the same as the dancer and my observation of her/him. At a macro level, the relationship between cyclones/anti-cyclones is the same between the implied mirror plane in my own body and my ears (the opposing vorticies). Taking the position that we are observers, part of a single curious entity, and each experiencing reality from a different POV makes sense to me (in a 3 musketeers way - "one for all and all for one"). But it only goes to raise further questions about the nature of the curious one. Thinking on this point, it could be argued that humanity, a large biomass on the surface of this planet, is constantly regenerating and dying in order to experience new realities through our perception of time. In short, if you were to look at humans under the microscope and our colonisation of the planet and moving and changing populations you could argue that the single entity of humanity is here to experience new things. Therefore in answer to the question = what is the meaning of life - you could answer 'to support the oneness of humanity in experiencing new realities'. Perhaps a catalogue exists in 0 where each reality (shakespeare, hans blix, oprah) is recorded in a time labelled fashion allowing easier reference when we die and want to check it out. Also sorry to others as I have no idea about Lazarus/Vedas/Tolmec's nor do I have any animal inside me. Not to dismiss your posts, but I have no reference to ancient texts regarding this (appreciate the links though) and personally feel satisfied with moving forward with Fintan's (and others) work in the field. Fintan you've gotta check this out! Remember the Egyptians, and how they worshiped The eye of Ra and the eye of Horus...? "Designed to resemble the eye of a falcon, this symbol is called the Eye of Ra or Eye of Horus represents the right eye of the Egyptian Falcon God Horus. As the udjat (or utchat), it represented the sun, and was associated with the Sun God Ra (Re)." "The mirror image, or left eye, represented the moon, and the God Tehuti (Thoth). (A very similar concept of the sun and moon as eyes appears in many religious traditions)"
"Together, the eyes represent the whole of the universe, a concept similar to that of the Taoist Yin-yang symbol. Spiritually, the right eye reflects solar, masculine energy, as well as reason and mathematics. The left eye reflects fluid, feminine, lunar energy, and rules intuition and magick. Together, they represent the combined, transcendent power of Horus." The relationship between the subconscious and conscious is in my opinion deceptive and connects to the mirror plane theory. As fintan mentioned in the first audio, the mirror reflection when we look into it is conceptual, not confirmational (you're not checking reality when you look in a mirror) in the same way, could the subconscious/conscious mirror also be conceptual, rather than confirmational? ie we're not checking our memories, we're creating the assumption of remembering something in the 'past' (because time is also conceptual). Much like the character string that your email account may ask you to identify, as a computer cannot -could the gateway to the subconscious merely be a matter of decyphering the character strings? One thing I'm trying to understand better is the power of our brains. I'm of the belief that my brain (and yours) is capable of storing vast amounts of data. In fact, probably some aspect (smell, sight, sound) of every part of our lives. 'What the bleep' interviewees also discuss this point and the massive amounts of data interpreted by our subconscious every second - eg. regulation of temperature in different parts of the body, amount of blood needed for a specific organ etc etc. Therefore something as substantial as reading a book would dictate multiple sense recording (the feel of paper, weight of book, colour of ink etc). Whilst I'm happy to incorporate quantum ideas regarding probabilities in my reality I'm not yet able to visualise them in a way which guarantees successful prediction, or the inclination of successful prediction. I mention this because I've always been interested in the idea of 'enlightenment' and I equate that with some ability to make informed predictions based on the pool of knowledge. I wonder what steps must first be taken on the path to what I understand as full and complete knowledge which I assume is access to the subconcsious and as stated above, a link to all the information my brain has ever recorded. I note that Fintan intends to discuss the tree of knowledge next. I've read a few short articles on meditation but i don't really understand the application to be honest. Prediction is another factor that we all in this forum must accept in order that Fintan's hypothesis be proven out. Fintan's hypothesis in the first 3 audios was that the human body was a representation of the processes involved in the creation of the universe (right?). Therefore, in order that the theory move forward with support, we/he must continue to predict something in reality based on the information learnt. For example, if it were accepted in this forum that the Treeincarnation model of the hypersphere could be applied to the the darkmatter debate or the movement of comets around white dwarf stars; the detail Fintan has given should allow us to apply that model and test it. On a personal note, I'd like to say that I've noticed some people who seem to invest a lot of belief/hope in the audio shows so far. I don't believe that Fintan is some sort of 'preacher' (any Nathan Barley fans out there?) but that his ideas should be discussed as much as possible, like anyone else. [Case in point, a dude has just 'improved' Einstein's theory of relativity: http://www.pparc.ac.uk/Nw/EinsteinTheory.asp] Anyway, there seems to be a need for Fintan to have 'the answer'. This also applies to the wider world of CIA fakes. Personally I read a number of news sources (including Break) and form my own opinion of events, rather than relying on a sole source for the 'truth'. Seriously folks, let's take everything said here, including this, with muchos salt. In order that these concepts can be appreciated fully, they must withstand intense scrutiny. Remember, we're talking about the nature of the universe so let's not jump in the deep end without questioning whatever you feel appropriate. I have just listened to episode 4, absolutely breathtaking !! Your insights are both profound and simple at the same time. It certainly resonates as true at the very core intuitively. I will have to review all 4 episodes again to help penetrate the paradigm wall. Most theories on the nature of reality seem compartmentalized, embracing empirical, rational OR transcendent, ignoring the implications of information from either of the other two disciplines. Ignoring the implications of the participator phenomenon has been particularly irritating. But, after listening last nite, I have been joyfully astonished to feel on the verge of understanding your crack in the matrix, it seems shimmering not quite so concrete in my perception. I'd say it's a wonderful, gleeful, universal corroboration !! Thank you Fintan for this amazing breakthrough in the process of reclaiming present moment sentience with the knowledge you are unravelling and sharing. I've just returned from a weekend camping out in the bush, listening to Ep. 4 again around the campfire. 2nd time for me, first for my partner, she loved it. Great evening, thankyou Fintan - you make great recordings and I'm glad you've now got the phone interview system working well. great music also and yes, I also like the new theme, thanks Connel AND the comedy sketch. Fintan, I once read a book The Third Ear by a German academic/musician who suggests that the ear is the most sophisticated, and important, sense we have. The fine hairs in the cochlear sense 8 octaves as opposed to the eye's retina sensing 1. The ear operates in 3 dimensions and is directional - we hear something , then use the eye to confirm. It can multitask i.e. the woman you are talking to who is secretly listening to someone else, yet she hears both conversations. It can be backed off, as you do in a loud disco, but you can't turn it off. We can remember notes as songs over many octaves, but we find it very hard to remember a particular blue colour when in the paintshop. The author then goes on the explain octavising. The octave of A440 is A880, you double to get an octave. But what if you take the frequency of the earth's rotation around the sun, or the moon's rotation around the earth and octavise them multiple times to bring them into the audio spectrum and further on to the light spectrum? Unfortunately I lent the book so I can't reference which was which , but the basic outcome was a frequency of A-435Hz which is the tuning originally used by Bach, Mozart, Beethoven and, my addition, Jimi Hendrix. The tuning was raised to A440Hz by the French in the 19th century as it made the instruments sound brighter. The other frequency returned as the Om note in Indian music which is their tuning note and the frequency every musician must learn. In the light spectrum I think they both returned as Buddhist red, aka Dali Lama red. It's through our ears that we communicate with this space, we make sounds for everything using the whole audible spectrum, and we call them names, and nouns and verbs etc etc and we transfer these sounds to each other. We still don't know what anything really is but we feel secure in the sounds and names we give things. And sounds are just numbers as we now know with digital sound and, as you said, it's all about numbers.